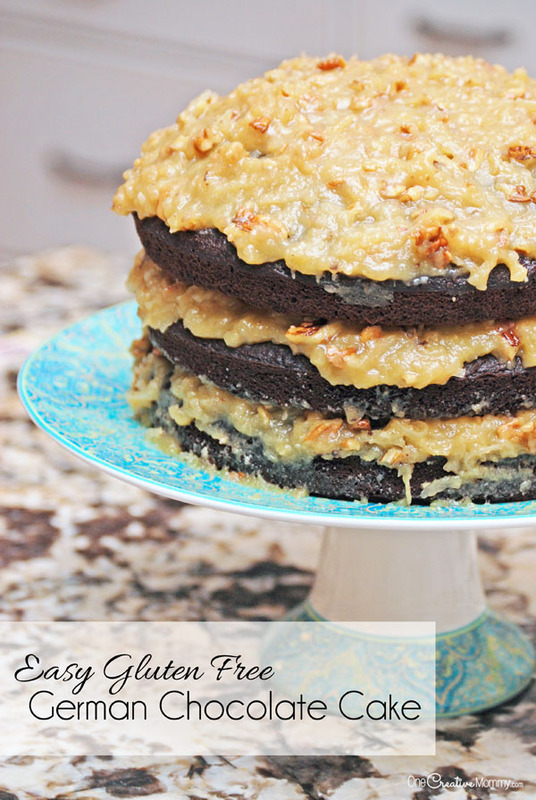 I’m excited to introduce today’s guest blogger–Sarah from Sarah Bakes Gluten Free Treats. I’ve been following her site ever since I learned that Boo had celiac disease. 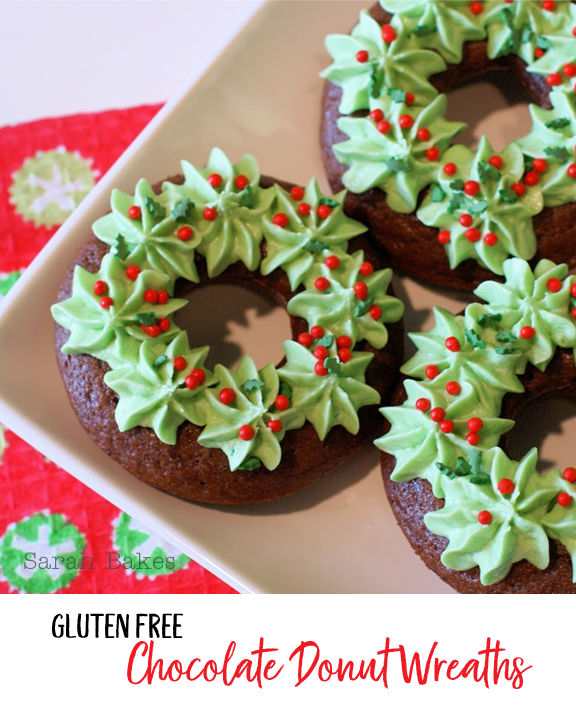 Sarah has the most wonderful gluten-free treats on her site! Are you ready to learn how to make gluten free donuts? Hello there! My name is Sarah and I have a huge heart for baking…gluten free! I share all of my most favorite recipes and baking adventures over at Sarah Bakes Gluten Free Treats. From cakes to cookies, to bread, to muffins. All of my recipes are gluten free, and you’ll find dairy/egg free goodies too. A little something for everyone to enjoy! Be sure to check out Sarah Bakes on facebook, twitter and pinterest…so you never miss one of my new gluten free recipes! I’m so excited to be joining the other 12 fabulous bloggers for the 12 Days of Christmas here at One Creative Mommy! This is my most favorite time of the year for baking. Peppermint, chocolate, cranberry, spice…the yummy smells of Christmas. It really is such a special time to be in the kitchen, baking for your friends and family. Making and sharing memories with those you cherish the most. Love it! 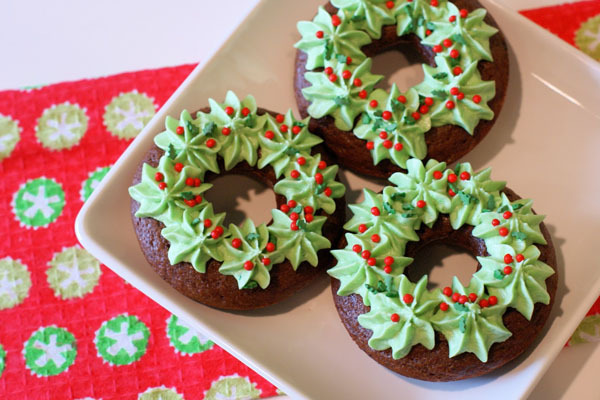 What says “Merry Christmas” more than a Christmas wreath donut? It’s the perfect treat to serve your family on Christmas morning. 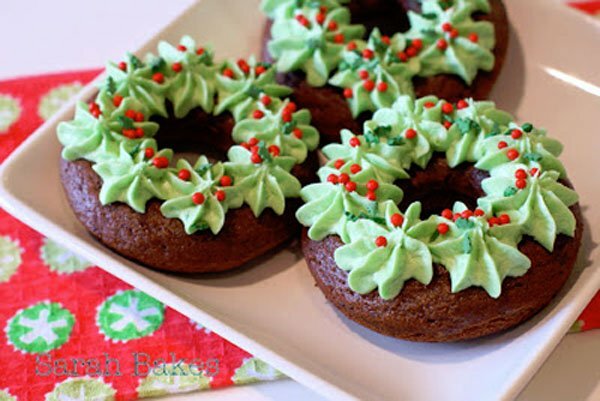 Beautifully baked donuts decorated with lovely green frosting and sprinkled with a little holiday cheer. I love that this recipe is so versatile, too. I like to make them without eggs or dairy and it’s so simple to do. Either way, they will be scrumptious! Your kids can help put these together, and they will have too much fun frosting these little beauties. Taking something deliciously ordinary, like a donut, and making it festive for the holidays! Preheat your oven to 450 degrees. Spray a non-stick donut pan with cooking spray. Mix together the flour blend, cocoa powder, sugar, baking powder, and salt. Add the egg, vanilla, and milk. Mix until well blended. Slowly add the oil, as you continue to mix. Stir until combined. Place the mixture in a large plastic ziplock bag and seal. Cut off a corner of the bag and pipe into each donut cavity, 2/3 full. Bake for 8-10 minutes or until donuts spring back when touched. Cool on wire rack. If you need to, let the pan cool and bake another batch. Wait until cooled before frosting. *To make a flaxseed-egg, simply mix together 1 tablespoon ground flaxseed meal and 2 tablespoons warm water. Allow to sit for 5 minutes, to thicken. Combine butter, powdered sugar, milk and vanilla. Beat together until smooth. Add an extra tablespoon of milk if needed. Start with just a couple drops of green food coloring. Stir and add more until desired color is reached. Place frosting in piping bag with star tip. Pipe stars around the cooled donut. Top with holiday sprinkles. An extra thanks to Sarah for this recipe. She was sick with the flu, and she still took the time to prepare this post! Thanks for the fantastic recipe, Sarah. My little one has really been missing donuts. She’ll be so excited to try these! Thanks for stopping by today. I hope you’ll stick around and browse more yummy gluten-free recipes. The images below are linked to posts, so click on them to pay a visit and get more ideas. Heidi – Thanks for sharing a post from another great blogger! I’m really enjoying your 12 Days of Christmas Holiday Series!!! Again, so glad to have had a chance to join such a great group. Sarah – Your donuts look amazing! How festive!! Hope you feel better soon and have a wonderful holiday season! Thanks for hosting, Heidi, and have a great week! Oh these little wreaths are adorable! Love them. Hope you have a great week! Thanks for hosting! This week I’m sharing my recipe for a low-carb, grain-free fried “rice” made with cauliflower. Happy Monday! Hope your week is off to a good start! I’ve linked up a cleaned up version of my Grandma’s Apple Meatloaf. I’ve made it grain-free, gluten-free, and dairy-free. Thanks for hosting! So many wonderful recipes. I have shared Spritz cookies and Butter Tart Squares. No one would know that either one of these recipes are free from gluten, dairy and refined sugar. Sarah these donuts looks so cute, I love them. Thanks for sharing the recipe! I just think those donut wreaths are adorable, and I’m sure my family would like them, too! I love how you decorated the donuts! I think I can do that! Hi Heidi! You are so talented, everything little thing is perfect! They look delicious too! Did you make those in a mini donut pan or a regular size? Hi, Jennifer. 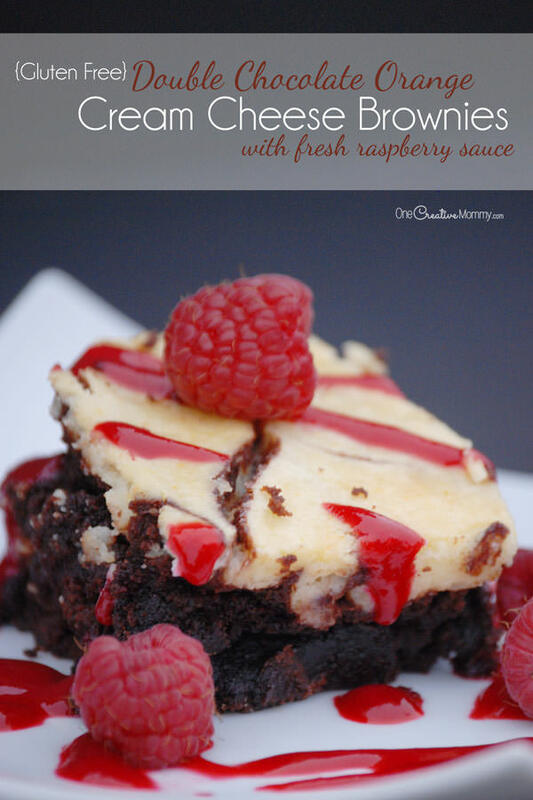 This was a guest post on my site, so I have never actually made this recipe. To me those look like regular-sized donuts, but I bet you could do any size you would like. Thank you so much I am going to try making these for my family for christmas. This is my first year of gluten free living since I only got diagnosed with celiacs about 7 months ago and I was still learning how to cook homemade meals so when they threw gluten free at me I wasn’t ready, but thanks to all the help of sites and books like yours I have come a long way. My kids and hubby actually like that I have celiacs because I cook so many good things now they say haha. It can be frustrating though and spendy, but I am learning. Thanks for all the help I wouldn’t have made it without people like you!! You’re so sweet, Jennifer. I agree, that getting started is tough, but it does get easier. We only have one gluten-free kiddo at our house, but we stay gluten free for everyone at dinner. There are lots of yummy things that are gluten-free. This trick is finding them! I agree that there are a lot of great gluten-free sites out there, and gluten-free pinterest boards are a huge help to find the helpful sites.